Use Golfer's Distance to become more aware of your club performance. It helps you taking the right decisions on the course. Attack the flag! 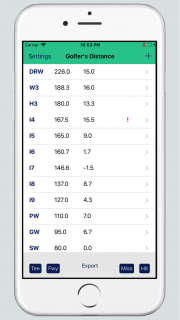 The Golfer's Distance app helps you to analyze the distance for all your clubs in the bag. It supports you in your club selection process on the golf course. With Golfer's Distance Pro you become aware of the scatter of your shots and about the influence of hitting from tee or fairway. Based on the stored data you also see how your consistency and distances of your shots are developing. 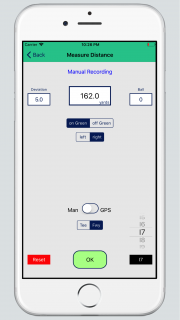 You can record data by GPS measurements or by manual input in case you have data from club-fitting or launch monitors. We have added an optional In App Purchase called Course Master Module to Golfer's Distance. It is basically a map view which uses the recorded yardages for selecting the right club for your next shot. Why we developed Golfer's Distance? Find here a post that explains the motivation to develop Golfer's Distance. Go there. The table view per club gives you the summary view in terms of distance and deviation from the target line (mean values). This data is derived from your acquired swings. You can distinguish between data of shots from tee or fairway and balls hit or missed the green. For each club you can access the detailed data behind the analysis. You also see the scatter of results in terms of length and deviation variation. This is a good indication for your shot consistency. Data can be acquired by GPS measurement and manual input. The GPS module does not only provide the length of the shot. It also gives you the deviation perpendicular to the target line. In case you need some help to use Golfer's Distance please check first the Quick Start Guide and the frequently asked questions below. If you do not find your answer there or if you want to report a problem please use the support request form. We have prepared a number of tutorials to introduce you in a straightforward way in working with Golfer's Distance. GPS does not work. What to do? Maybe you have rejected to use GPS for this app. Check the preferences in the iOS Setting for this App and enable GPS. How can I delete swings? In the main view select the related club to access the detailed view per club. Activate "Edit" in the upper right corner. Touch the row and sweep to the left. How can I modify data after a swing has been stored? 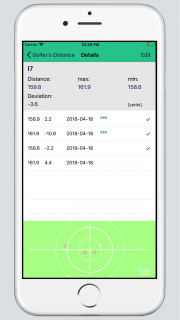 The feature to modify data is available from V1.7 of Golfer's Distance. Go to the swings per club and select there the data set to be modified. A new screen is opened where detailed information of the data set is shown. After pressing Edit (upper right corner) you can modify parameters. Do not forget so save! Please use this form in case you want to report a problem or if you do not find your answers in the Quick Start Guide or the FAQ section. Thanks for placing this support request!